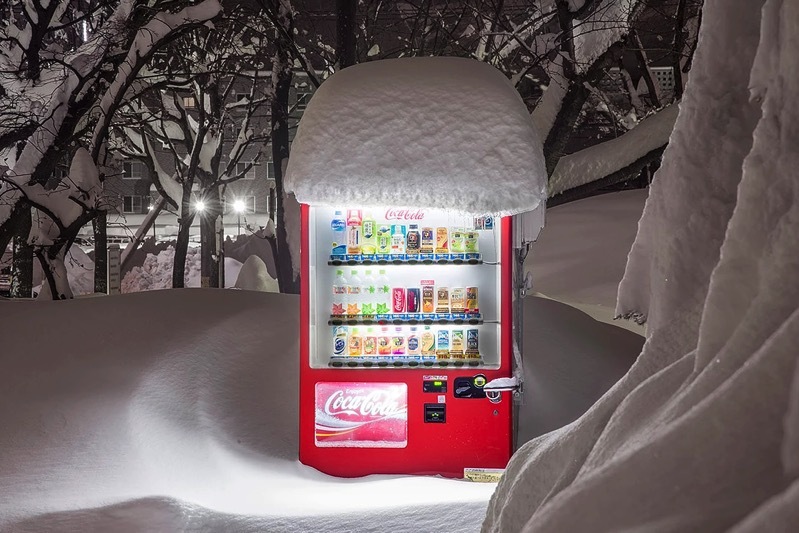 Japanese Vending Machines at Night Juxtaposed with a Wintry Hokkaido Landscape #ArtTuesday « Adafruit Industries – Makers, hackers, artists, designers and engineers! Beautiful work from photographer Eiji Ohashi featured on Spoon & Tamago. “In Hokkaido where I live, winters are harsh and snows are deep,” says photographer Eiji Ohashi. “Every day can become rather inconvenient” due to the constant snowfall. But heavy snows also bring wintry wonderlands and the discovery of small pleasures. One snowy night. Ohashi was walking outside when he found himself transfixed by the form of snow that had piled up on top of a vending machine. Japan has the highest penetration of vending machines per person (there’s roughly 1 vending machine for every 23 people in Japan) and the fact that the majority of them are outdoors is a testament to the country’s safety and respect for property. Very rarely are these machines ever vandalized.